Tested on Emulators and Hardware. If you want to save your created sounds or use them into YM2612 emulators synths or trackers (FMDrive VST, Deflemask, VGMM), you can use an emulator like Regen or Gens to dump the channel as a .tfi file which can be loaded into capable VST or Trackers. 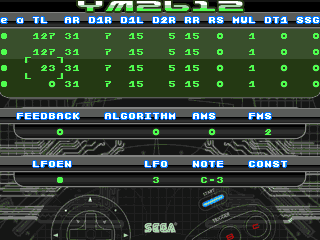 YM2612 Instrument editor lets you control the Sega Genesis FM sound chip in real time, access the main parameters of the Channel 1 and select which note to play. If you want to save your created sounds or use them into YM2612 emulators synths or trackers, you can use an emulator like Regen or Gens to dump the channel as a .tfi file which can be loaded into capable VST or Trackers. It is also a useful tool for YM2612 musicians or Genesis developers to quickly test a sound directly on the hardware in a friendly way. alter the options in real-time. If it's disabled, you trigger the note once and the registers stay the same until you trigger the note again. The freely download-able FMDrive VST manual will helps you to understand this powerful sound chip.